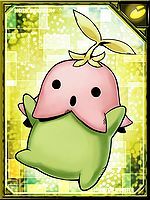 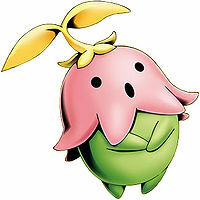 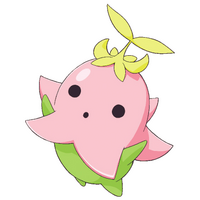 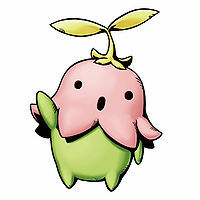 A Plant Digimon which has an appearance like a flower bud. 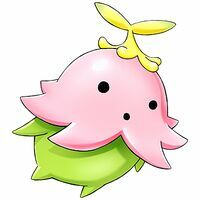 It spins the leaf on its head to fly unsteadily, and is expressionless but charming. 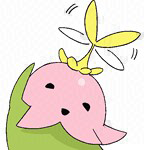 Its Special Move is firing solid nuts from its mouth (Nuts Shoot). 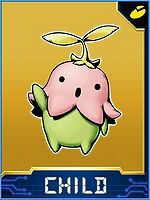 Its aim is surprisingly accurate. 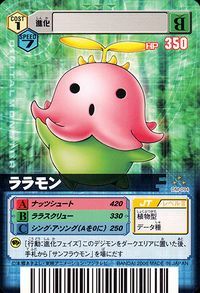 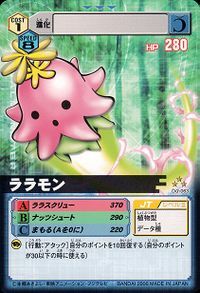 Also, it can spin its leaf with all its might to assault the opponent (Lala Screw), and put the opponent to sleep with a pleasant song (Sing a Song). 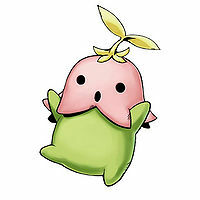 | Lala 「ララ Rara」 is a sound associated with singing; "la" is the sixth tone of the diatonic scale. 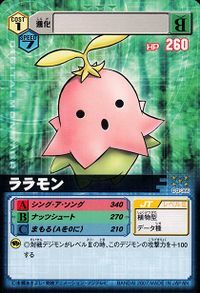 Nuts Shoot  ナッツシュート Nattsu Shūto Seed Blast Shoots hard nuts from its mouth with surprising accuracy. 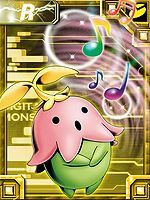 Sing a Song  シング・ア・ソング Shingu a Songu Lullaby Sings a soothing lullaby in a calming voice that puts the enemy to sleep. 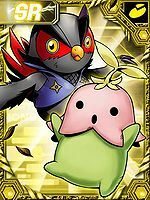 A more powerful version of Nuts Shoot. 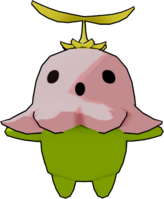 Fires a nut from its mouth with great force. 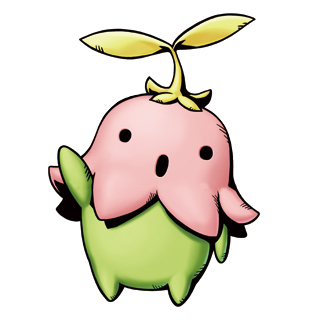 Fires exploding seeds from its head. 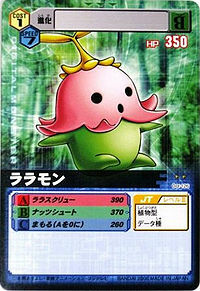 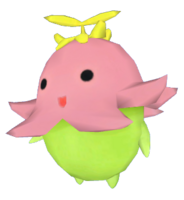 Lala Screw  ララスクリュー Rara Sukuryū Lala Spiral Charges into the opponent by spinning its leaf with all its might. 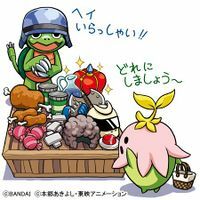 Can also be used to cut things. 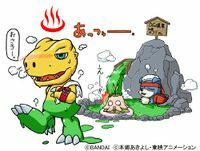 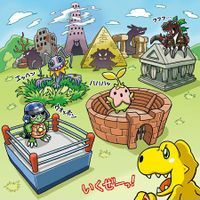 Lalamon is the partner Digimon of Yoshino Fujieda. 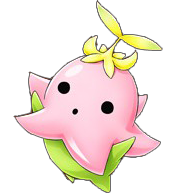 She is a main playable character. 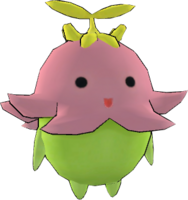 Lalamon is an obtainable Digimon which is evolved from Budmon, and can evolve to Birdramon, Leomon, Seadramon, or Sunflowmon. 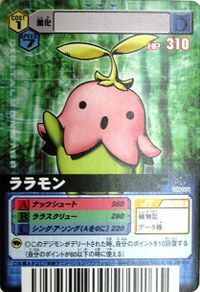 It can also be obtained as a collectible card. 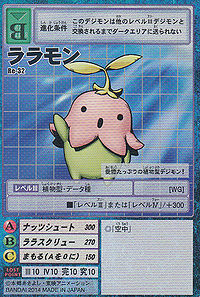 Its card is part of the Lalamon Evolution (ララモン進化 Raramon Shinka) set. 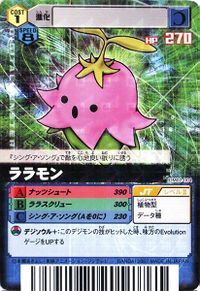 Can be obtained as a Burst Evolution of Pinamon. 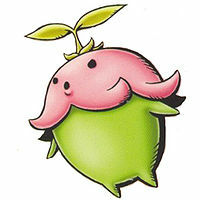 This Plant type Digimon is full of charm! 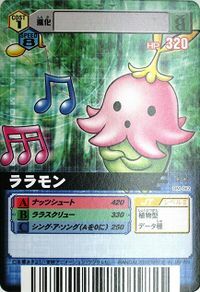 With its "Sing a Song", it puts the opponent in a pleasant sleep.